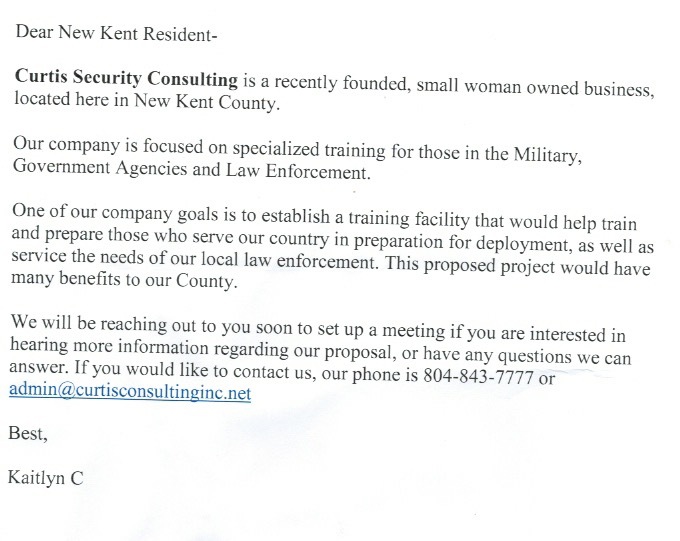 Curtis Security Consulting, Inc. has submitted an application for a “Conditional Use Permit” to build and operate a combat training facility in Barhamsville, VA. The location plan shows the proposed location of the facility near the corner of New Kent Highway (Route 30) and Farmers Drive (Route 273). According to the application and the site plan, the proposed facility would contain an asphalt driver training course, an off-road and unimproved road driving course, four 100-meter multi-purpose shooting ranges, and one 300 meter qualification shooting range. In addition there would be self-contained Simunition training areas and a ballistic shoot house. On any given day, the facility could have as many as 120 students and 40 vehicles; operations could consist of 18 student drivers on each course and 15 students at each shooting range. Because of special features, part of the facility could be rented by a client and add to that number. According to the application, most of the clients would not be from the area, and the facility would not be open to the public. The proposed facility would be in the heart of Barhamsville, behind the Post Office. The “Standard Hours of Operation” would be 7 am to 7 pm, Monday – Saturday. The additional “Nighttime Hours of Operation” for outdoor shooting and outdoor use of “Tactical Sound Infusion” (simulated IED roadside bombs) would be 7 am – 10 pm, Monday – Saturday. There are to be no more than 40 explosions in any calendar day, with up to 12 individual incidents per hour [as often as every 5 minutes]. Firearms used in training would be limited to weapons generally characterized as “small arms” (not exceeding .308 caliber / 7.62 mm in size for rifles, except up to .50 caliber for hunting rifles). The applicant has stated that they intend to use 9 mm pistols and AR-15 and AK-47 rifles. The use of mock firearms blasts (e.g., simulated rocket propelled grenades) and simulated explosions (e.g., simulated IEDs [roadside bombs]) would also be carried out on the property.